Spanning a wide-angle to telephoto range, the EF-S 17-85mm f/4-5.6 IS USM from Canon is a 27.2-136mm-equivalent zoom designed for EF-S-mount DSLRs. This reach is complemented by an optical design featuring one dual-sided aspherical element, which helps to minimize distortion and spherical aberrations in order to realize greater sharpness and clarity. A Super Spectra coating has also been applied that reduces flare and ghosting for improved contrast and color accuracy. The lens also features an Optical Image Stabilizer, which minimizes the appearance of camera shake by three stops to better enable shooting handheld in difficult lighting conditions. Additionally, a ring-type Ultrasonic Motor is featured, too, which affords quick, quiet autofocus performance along with full-time manual focus override. Standard zoom is designed for APS-C-format Canon EF-S-mount DSLRs, and offers a 27.2-136mm equivalent focal length range. One dual-sided aspherical element minimizes spherical aberrations and distortions for improved sharpness and accurate rendering. An Optical Image Stabilizer helps to minimize the appearance of camera shake by up to three stops to better enable working in low-light conditions and with slower shutter speeds. 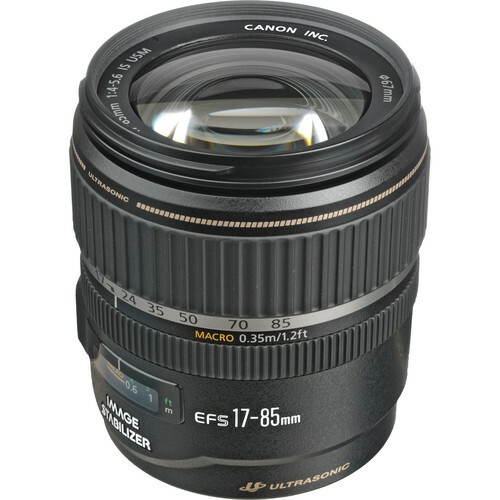 EF-S 17-85mm f/4-5.6 IS USM Lens is rated 4.1 out of 5 by 268. Rated 4 out of 5 by GreggT from Great all-purpose lens As others have said this is a great all-purpose lens, the extra mm at the wide end over the 18-55 or 18-200 really makes a difference. The only other choice at the wide end is the 10-22mm, and that isn't as versatile. Stabilization works very well. I've had two issues requiring repair, an auto-focus failure, and an aperture iris failure. A friend who is a professional also has one, and the zoom has locked up on hers. The lens zoom barrel has little resistance, so if you're not careful to ensure the lens is zoomed in to 17mm, putting the lens cap on with the lens extended can cause the barrel to slam back into the lens body. Overall I'm very happy with the lens, however. Rated 3 out of 5 by Kurtis from Nice lens, but problematic I've had this lens since my 20D and have used it a lot for everyday photography. I have been very happy with the lens performance and the resulting photos I have taken. However, the lens started to malfunction recently - unable to achieve auto focus. The problem occurs in various lighting conditions and aperture settings. After searching a few forums for information, it seems that this is not an uncommon problem. I've read about several users having to have Canon replace the servo motor as the fix. So, great lens, but disappointing in what we have come to expect from Canon quality. Rated 4 out of 5 by R from Great Value This lens is a great alternative to the standard 18-55mm IS. Its extended range makes this a great all-purpose lens. Superb quality for a Non-L lens. I do wish that the green/cyan chromatic aberration weren't as apparent. I used this lens in college and for some light commercial work. It has served me well for the past 3 years, and I will sad to see it go when I make the switch to the new 5D mark II and will no longer be able to use it. I purchased it with a 20D and it has been an excellent pairing. Rated 5 out of 5 by James from Great Lens I bought this lens to use with my 7D MKII. It is replacing an 18-55 MM Kit lens I bought along with my 20D. I use this lens almost?exclusively with my 7DMKII. It is a little heavy and I can't see holding the camera by hand with the lens attached for a long time and I can't store it with the lens attached to my 7DMKII? in my Think Tank Camera bag but I deal with it as part of the adjustment one sometimes has to make when upgrading.? It has operated flawlessly?right out of the box. It has been recommended as an upgrade for the 18-55 kit lens and it definitely is. I am still in the learning curve with this lens so I can't say much more. Rated 3 out of 5 by Anonymous from Look for the 18-200 mm IS instead I upgraded to this lens instead of the low cost 18-55 that came in my XTi kit as my first lens. The IS system is great and I've benefit from it many times - wouldn't buy a non IS lens now... However, it produces a good image quality overall for portraits but the lack of sharpness limits its real use - be ready to increase your sharpness in Photoshop to make good prints. It hits F 4.5 @ 24 mm only & F5.0 @ 35 mm...A good flash should be your first accessory...For the price, go for the new 18-200 IS - similar quality but ideal for traveling as 85 mm comes short quickly. But if you're serious and can afford few bucks more, check the 24-105 mm F4 L IS. Rated 5 out of 5 by camera12345 from Great buy This is a great lens for the money. I use it mostly for wedding photography. The nice wide 17mm end works well at the bride's home and for church interiors. The 85mm end works well for portrais. Although it isn't a fast lens, the image stabilization works very well. I often hand hold at 1/15th or even 1/8th sec with sharp results. Also as far as sharp goes, it's so sharp you can see skin pores in close ups. All for a reasonable price! Rated 2 out of 5 by Bobbi from Nice lens, poorly made Used this lens for several years, replaced it with Tamron 18-270, not as sharp. During my time with the 17-85, I enjoyed its sharpness and light weight. However, midway through, it lost its autofocus and I had to have a repair by Canon, not cheap. A year or 2 after Tamron replacement, I began using it again. To my dismay, once again, the autofocus failed. Checking the web, I discovered many, many complaints about the same thing from other angry users. To sum up, it does still work on manual focus, which is easy to accomplish and the camera beeps when focus is achieved. So I can say that if you purchase at this much reduced price with these caveats in mind, it's a good deal. Rated 5 out of 5 by E.Serra from Nothing less than Amazing! This lens which I just purchased for the 2nd time, since I wore out the 1st one I owned , is nothing less than amazing and spectacular. Presently is much cheaper than what I paid for it a few years ago. It is very versatile, light , agile and reliable. The focus is fast and the results are pristine. I dare to say it does the job as good as an L-lens. Lets say an L-lens is a first class ticket and this lens is a coach ticket. It's not the way you fly that matters it's the fun you have when you reach your destination! This baby delivers!!! 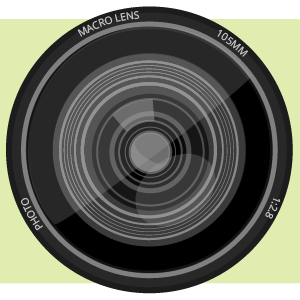 Will this lens work with Canon 10D? Yes, this lens is compatible with the Canon 10D. Does this work with rebel T6i ? The one I just bought works with my T4i but not my new T6i? Yes, this lens is compatible with the Rebel T6i. Does this lense work with T7i? All EF-S lenses are compatible with the T7i. can it be use with the Canon 7D.? In other word is it compatible with the Canon 7D? Can I use this lens on my Canon SL1 camera ? Does this lens work with NIKON 3400? is it made in JAPAN ? According to the box mine came in, it was made in Taiwan.